Every morning I wake up to the sound of birds singing and look out my window. There are bees buzzing around the blackberries, the raspberries are full of luscious hanging fruit just waiting to be picked again and the collards are getting so big they are starting to crowd each other. This morning there are baby birds chirping in the huge Sequoia that we share with 2 other neighbors in the back corner of our yard. They must be waiting for their mother to bring them some grub. I can hear morning doves off in a distance and the scurrying of mother squirrel running across the top of the fence looking for those nuts that Jeffrey left out for her. Isn’t summer time the best time of all. Everything comes to life. Only out here in Oregon where we live the grass dies in summer because it’s so dry. But the garden flourishes. We can grow pretty much anything out here. I have collards, peppers, zucchini, cucumbers, radishes, beets, 2 kinds of kale, spinach, 2 kinds of raspberries, native blackberries, garlic, onions, potatoes, tomatoes, mesculin, strawberries and blueberries. It takes a bit of doing to keep everything watered in the summer dry months but right now we are still getting rain so its not so hard. 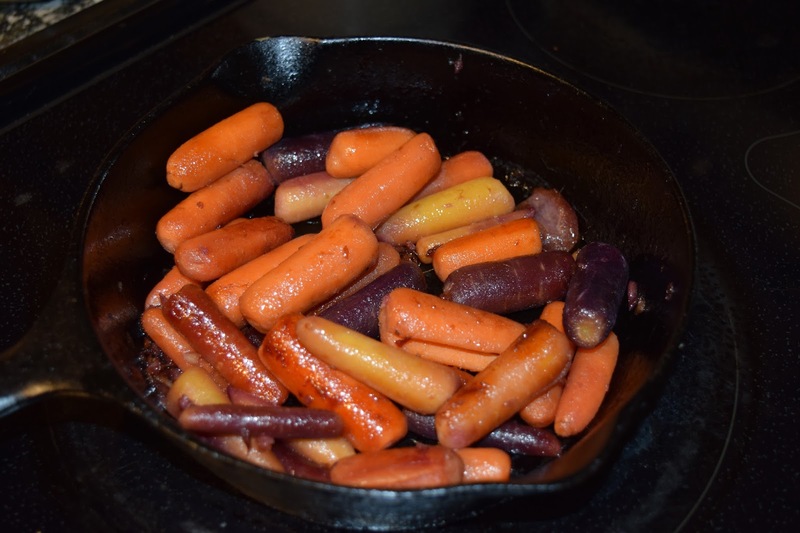 The possibility of all of this future bounty inspired me just the other day to create a supper with mainly vegetable dishes and so I made a Yellow Squash and Mushroom skillet dish, with Caramelized Tri-Color baby Carrots and Jeff made a wonderful Summer Vegetable Soup. Here what I did with the carrots. They are so sweet and yummy without adding any sugar. Just pour a little bit of oil into a hot skillet ( I use an iron skillet) then add about a teaspoon of finely minced fresh ginger. Saute that for just a minute then throw in a bag of those baby colored carrots (later if you have carrots in your garden you can use them) and drizzle them with a fruit vinegar I use this wonderful Rose Vinegar that I get from Safeway but you can use raspberry vinegar or fig vinegar or any other one you might have in your pantry. Cover them and let them cook until they are tender stirring them occasionally so they do not burn. You may need to add a little bit of water at the end to finish cooking them and deglaze the pan so that they do not become too dry. Trust me these are amazing! I will give you the other recipes in the next blog which I will also get to today.